Best Buy is knocking the price of the original Asus Eee Pad Transformer tablet down to $250 for this year’s Black Friday "Door Buster" offer, according to leaked ads. The Transformer’s keyboard docking station will also be sold at a discount for the post-Thanksgiving shopping holiday. Asus’s convertible tablet was recently reported as the best-selling Android tablet, thanks to its versatility and increased battery life with the keyboard dock. The low (at the time) $400 price point for the tablet and $149 for the dock also made the Transformer TF101 one of the least expensive Android tablets at the time. Since then, however, Android tablet prices have plummeted, with Amazon’s Kindle Fire leading the way with a $199 price tag and Barnes and Noble’s competing Nook Tablet selling for $250. The Transformer is older than these value tablets, but it offers a larger 10-inch display, and the 16GB of storage is twice that of the Kindle Fire (the Nook also has 16GB of storage). 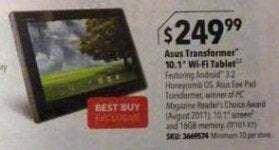 Best Buy’s leaked Black Friday ad reveals an exclusive TF100-X1 model of the Wi-Fi Transformer running Android 3.2 (Honeycomb). Most importantly, we can’t forget the Transformer’s biggest selling point: the keyboard dock, which Best Buy will offer priced at $99. At $350 for a tablet-laptop combo, the Transformer is definitely an attractive deal -- if you don’t mind having the last-generation tablet. Asus announced the Asus Eee Pad Transformer Prime just last week and the new tablet is expected to arrive with much fanfare this December. The Transformer Prime tablet boasts a Nvidia quad-core Tegra 3 processor for faster running of apps, as well as increased storage capacity. If you don’t want to spend $500 for the Transformer Prime, however, you can save a couple of hundred bucks on the Transformer TF101, as long as you get to Best Buy in time. Doors open at midnight on Black Friday; according to the ad, each store will have a minimum of ten tablets and four docks. Don’t expect these to last very long. The Transformer stands well on its own, but it's notable when paired with Asus's terrific optional keyboard dock, which adds an SD Card slot, USB port, touchpad, and extra battery.